#35 Around the Campfire; Save the Great Arctic Refuge Wilderness! Today, the National Wilderness Preservation System has 757 Wilderness Area units totaling 109,512,959 acres. Each Wilderness Area has great worth, but some stand out. Among those, the Wilderness Area that to me is the Flagship of the National Wilderness Preservation System is the Arctic National Wildlife Refuge Wilderness Area of 8 million acres in the eastern Brooks Range of northeastern Alaska. I think most of the more knowledgeable wildlovers would agree with me. Conservationists know the Arctic Refuge mostly for the 1.5 million-acre Arctic Coastal Plain so coveted for oil and gas industrialization by the energy industry, their eager politicians, and the Alaska growth establishment, along with some of the Inupiat (Eskimo) folks who want development. The Coastal Plain is yet wilderness, but not designated. It’s one of the most wonderful places on Earth (I’ve been there and know). For more than a score of years we’ve fought to keep drilling out and to designate most of the Arctic Plain as Wilderness. But the Arctic Coastal Plain isn’t the whole story—not by far. The 1980 Alaska Lands Act enlarged the Arctic National Wildlife Range from 8.9 million acres to 19.1 million acres and renamed the whole area the Arctic National Wildlife Refuge (almost the size of Ohio). 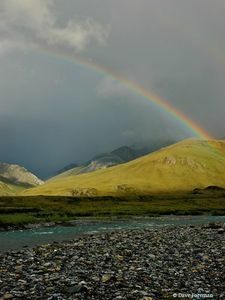 Eight million acres of the eastern Brooks Range in the original Range was designated as Wilderness. The 10 million acres added to the Arctic Refuge was more of the Brooks Range to the west and the Porcupine Plateau to the southeast. These lands were as wild as the original Range and brought in much greater diversity of landscapes, wildlife, forest, wetlands, and rivers. Now the U.S. Fish & Wildlife Service is doing a new Comprehensive Conservation Plan (CCP) for the Refuge and is weighing whether the rest of Refuge should be recommended for Wilderness Area designation. Right now, the 10 million acres of non-Wilderness Area on the Refuge are managed better as wilderness than most Wilderness Areas. But without legal designation as Wilderness that could change and development—roads, logging, tourist developments, overhunting and trapping, predator “control” of wolves, and other landscalping—could happen to the Western Brooks Range and Porcupine Plateau. Indeed, there is organized opposition to more Wilderness, including some development-oriented Native Alaskans. Because of this, some of the key Alaskan and national conservation groups have shamefully backed down and turned their backs on the great wilderness of the Arctic Refuge except for the Coastal Plain. Other conservationists, such as the Center for Biological Diversity and Wilderness Watch, have stayed steadfast for Wilderness. I will write another Campfire later on the ins and outs of this controversial deal. For now, though, I want to bid all of you to email the Arctic Refuge as soon as you can to support the maximum Wilderness recommendation for the Refuge. This is Alternative E. In addition to the 8 million acres of Wilderness already set aside, Alternative E calls for recommending 1.4 million acres of the Arctic Coastal Plain for Wilderness, 5.4 million acres of the Western Brooks Range for Wilderness, and 4.4 million acres of the Porcupine Plateau for Wilderness. This would make a single Wilderness Area of 19 million acres—the biggest designated Wilderness Area in the United States (the Gates of the Arctic National Park/Noatak River National Preserve Wilderness Area in the central and western Brooks Range is now the biggest at 12.8 million acres). 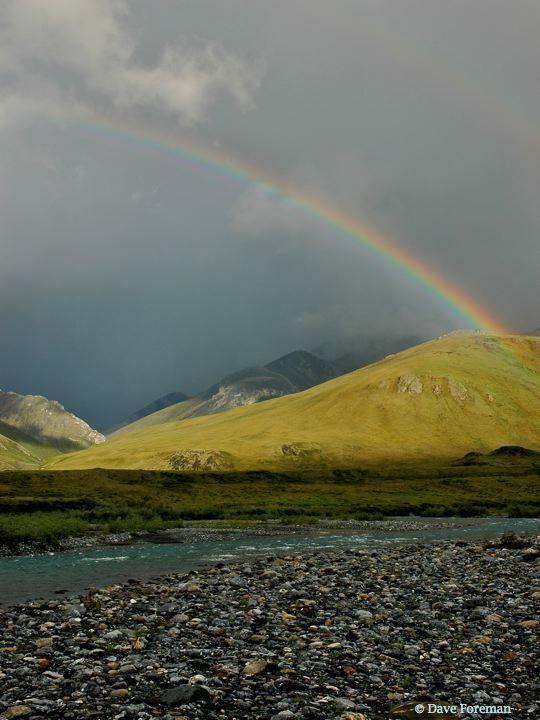 Wilderness Watch has a comprehensive, succinct alert on the Arctic Refuge Plan and Wilderness Recommendation. Instead of doing our own, The Rewilding Institute endorses the Wilderness Watch call to action. We reprint key parts of it below. Most of all, though, get an email in right away backing Alternative E—Wilderness recommendation for all qualifying lands in the Arctic National Wildlife Refuge. That recommends 11 million acres to be added to an 8-million-acre Wilderness Area for a grand total of a single 19-million-acre Arctic National Wildlife Refuge Wilderness Area. Doing so will be an inspiration to Earth-loving people the world over, and will keep a vast and tangled wilderness as a place for evolution in all its unfathomable mystery to roll on forever. Read the attachment below and ACT! I am strongly in favor of Alternative E—Wilderness recommendation for all qualifying lands in the Arctic National Wildlife Refuge. We need wilderness much more than we need more oil.